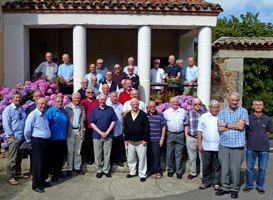 Australian Marist, Fr Gerard Hall SM, has led the annual retreat of the European Marist province at La Neylière, France. 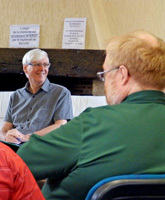 Above: Fr Gerard Hall. 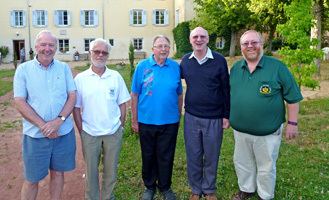 Below: European province retreatants at La Neylière / Australians, Frs Ray Chapmanand Gerard Hall with Fr Tony Kennedy, completing the international formators' workshop at La Neylière | Former missionaries in Bougainville, Fr Willy Weemaes and Bishop Henk Kronenberg (2nd and 3rd from left) 'honorary Aussies'. 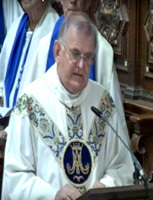 Among the memories of the Jul 23 Bicentenary Eucharist at Hunters Hill was the homily of Fr Kevin Bates SM, who presided at the liturgy and led the singing of the song he composed for the Fourvière anniversary. 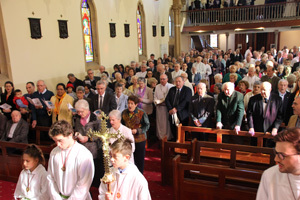 Sydney's city-centre shrine of St Patgrick's recalled the Fourvière pledge during one its Sunday Eucharists on Jul 24 when Marist family members renewed the promise of 1816. 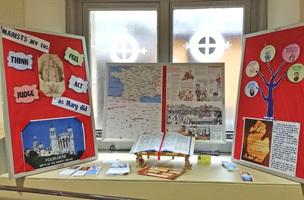 A display in the crypt of the church presented information and audio-visuals on the various Marist branches. 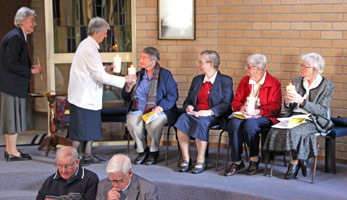 While the Marist world marked 200 years since the Fourvière Pledge, four Australian Marist Sisters celebrated 230 years of commitment. 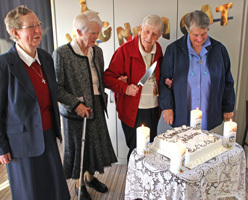 Jubilee celebrations at Woolwich, NSW, on Jul 24 honoured Srs Julia Lourey, Elizabeth McTaggart and Therese Campbell (each 60 years professed) and Sr Anne Saunders (50 years). 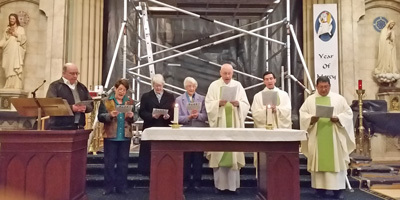 Marist provincial, Fr Bob Barber, joined Sisters and family members at Mass with renewal of vows, followed by afternoon tea and speeches in Marian House. 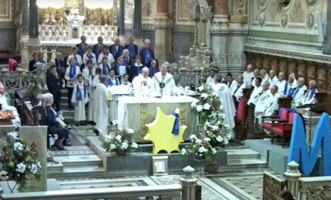 An international celebration of the Bicentenary of the Fourvière Pledge was held in the Basilica of Our Lady of Fourvière, Lyon, France, on Jul 23. The basilica stands alongside the ancient chapel of the Blessed Virgin to which the pioneer Marist aspirants climbed on Jul 23, 1816. Superior-General of the Society of Mary, Fr John Hannan SM, presided at the Mass which was live-streamed on the Internet and can been viewed from the link below. 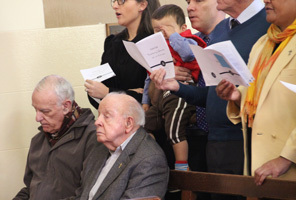 Above: Fr John Hannan SM, presides at the Bicentenary liturgy / Marist Sisters' Superior-General Australian Sr Grace Ellul SM | Sanctuary of the basilica of Fourvière / Fr Paul Loubaresse SM delivers a message from Lyon's Cardinal Philippe Barbarin. 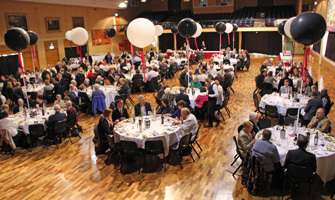 Below: Sr Teri O'Brien SM (J-M Chavoin Centre, Belley, France) / Missionary Sisters' Superior-General, Sr Georgeanne Donovan SMSM | Australian Lay Marists, Sue and Kim Chen (Tas), Sr Grace Ellul SM, Frs Tony Kennedy and Ray Chapman / Marist Brothers' Superior-General, Br Emili Turu FMS. 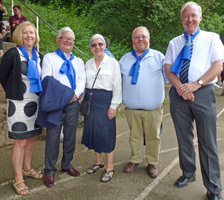 A packed church of the Holy Name of Mary, Hunters Hill, celebrated the 200th anniversary of the Fourvière Pledge on Jul 23. Members of all branches of the Marist Family recalled the promise of the Marist aspirants on Jul 23, 1816, to form the Society of Mary. Above: The spire of Holy Name of Mary church, NSW, Australia / .. and the tower of Fourvière shrine, Lyon, France. 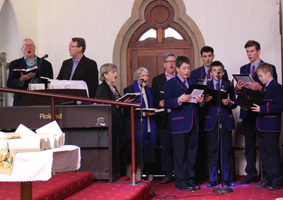 Below: Capacity congregation at Hunters Hill on Jul 23 | Choir of parishioners and St Joseph College students. 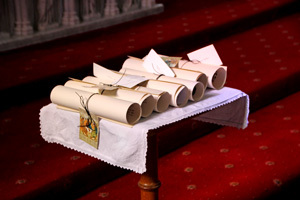 Above: Scrolls of commitment by each of the Marist branches / ... read by representatives of each branch. | Fr Kevin Bates presides at the Eucharist. 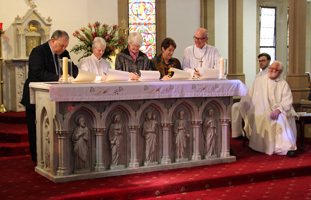 | Marist leaders sign their branch's commitment. to form the Society of Mary. 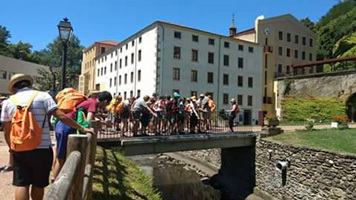 Young people from all over the Marist world have come together in France preparing for the Bicentenary celebration of the Fourvière pledge to form the Society of Mary. 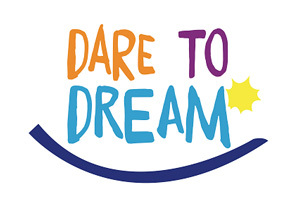 'Dare to Dream' culminates with the actual Bicentenary on Jul 23 at the Marian shrine of Fourvière, Lyon. 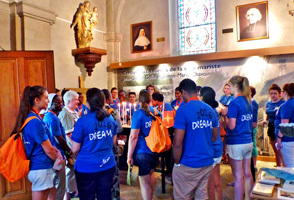 Above: Marist youth prepare for the Fourvière Bicentenary in Lyon / Fr Alejandro Munoz presides at one of the vibrant 'Dare to Dream' liturgies. 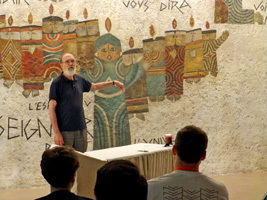 Below: Fr Bernard Boisseau with participants at the tomb of Fr Colin, La Neylière / ... in the Espace Colin, La Neylière | ... at the Marist Brothers' Champagnat heartland, the Hermitage | ... at Cerdon / Bon Repos, Belley, in the chapel where Jeanne-Marie Chavoin rests. 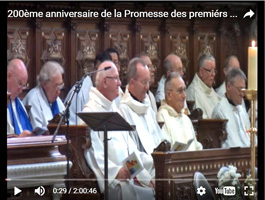 On the feast of St Mary Magdalene, Jul 22, 1816, Jean-Claude Colin and Marcellin Champagnat were ordained to the priesthood in Lyon, along with fellow Marist pioneers, Etienne Terraillon and Etienne Déclas. The four Marists-to-be were part of a group of fifty-two yong men ordained that day by Bishop Louis Dubourg, newly-consecrated bishop of New Orleans. 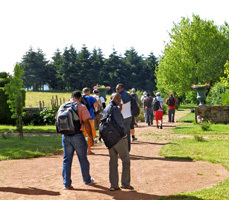 The following day they were to climb the hill of Fourvière as a group of twelve aspirants to seek Mary's blessing on their hopes for the Marist family. Left: Jean-Claude Colin when 50 years ordained / stained glass image of Marcellin Champagnat | Vestments of Fr Colin / preaching cloak and clerical hat in his bedroom, La Neylière. 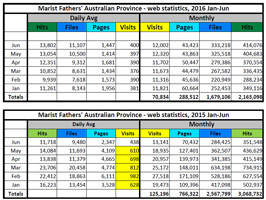 For comparative statistics for Jan-Jun 2015 and 2016 click here. A six-monthly review of visits to this web site shows a 'back to normal' result, following unusual and mysterious surges in early 2015. After blocking unwanted visitors, things have settled down to a pattern of daily visits in the 350 to 400 range. Half of these still come from commerical, Google-type sources. Top visiting countries, after Australia, include NZ, Canada, Italy, Germany, Brazil, Thailand, Cameroon, Japan and France. 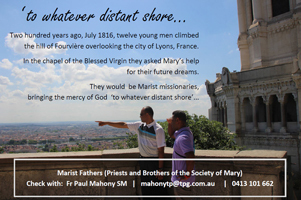 As the Fourvière Bicentenary draws closer a new page has been uploaded with resources for the Jul 23 event. 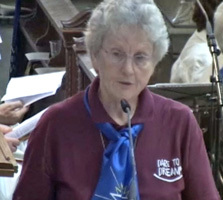 The page, on the Colin web site, has links to pledge, novena, Mass and prayer texts in as many as twenty-six languages. Click here for the new page. 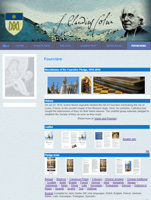 For the official Bicentenary web site click here. 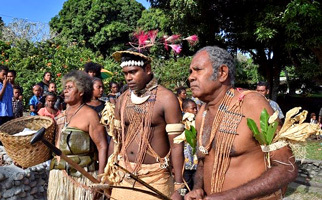 The recently-upgraded web site of Marist Oceania Province is regularly carrying up-to-date pictorial news and bulletins from the Pacific. Prepared by the Marist Family committee organising the Jul 23 celebrations, a novena commencing on Jul 14 is now available. Marist saint and protomartyr of Oceania, Peter Chanel, was born on Jul 12, 1803, in the hamlet of La Potière, central France. 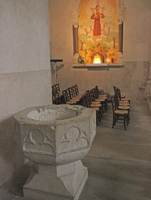 A few days later in the church of nearby Montrevel, the infant Peter was baptised. Later ordained priest (Jul 15, 1827), Fr Peter joined the Society of Mary in Sep 1831 and was a member of the pioneer Marist missionaries leaving for the Pacific on Christmas Eve 1836. He was martyred on the island of Futuna on Apr 28, 1841. 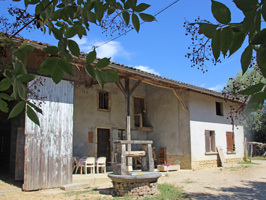 Fr Tony Kennedy SM is participating in the month-long workshop for Marist formators being held at La Neylière, France. A staff member of Marist College, Suva, Fr Tony joins formators from other Marist units worldwide. 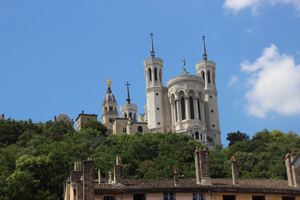 The group will attend the bicentenary celebrations at Fourvière, Lyon, on Jul 23. 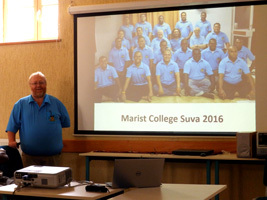 Above: Fr Tony Kennedy with a presentation on Marist College, Suva / pictured with the formators' group. 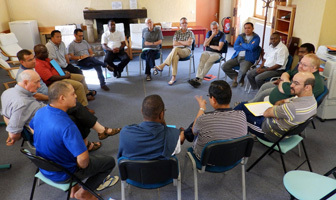 Below: Workshop session / Mass in the La Neylière chapel | Workshop co-ordinator, Fr Larry Duffy SM / Fr Tony in personal reflection time | The group on its 'Emmaus journey' to the Marian shrine of La Salette. From Davao City, Philippines, Fr Lionel Mechavez SM sends images of the arrival of a contingent of students from St Joseph's College, Hunters Hill, NSW, accompanied by Australian province member, Fr Gavin Foster SM (pictured far left). The Joeys lads will experience life in the Philippines during their school vacation and were welcomed by street kids from the Balay Pasilungan centre conducted by Fr Lionel and the Marists. Australian Marists mourn the passing of Fr Keith Shepherd SM who died peacefully on Jul 02 at Ryde Hospital after a short illness, aged 92. 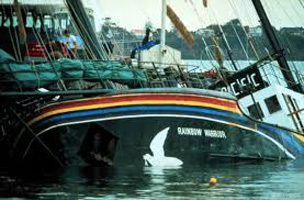 Fr Paul Mahony was with him when he died, along with his brother, Reg, and other family members. May he rest in peace.